Dubai, UAE, May 13, 2018: The Dubai-based Victory Team has eased into its final preparations to mount a multi-pronged challenge in the international world of watersports this season. As per the calendar prepared by the Jebel Ali-based set-up, Victory Team will be participating in the Class 1, Formula 1, Formula 2 and Formula 4 in the world of powerboat racing, while also making its debut on the UIM-ABP Aquabike World Championship through multi-world champion Kevin Reiterer. 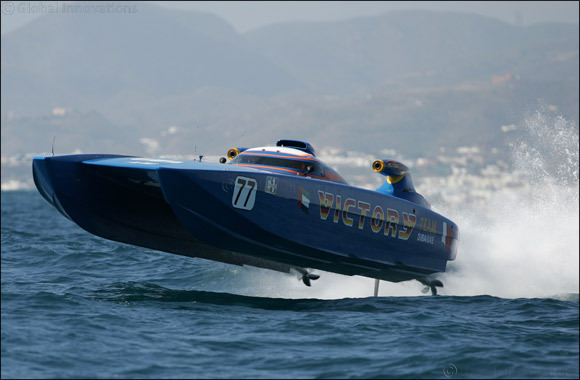 Even though Victory Team made its offshore powerboat racing debut in 1986, it wasn’t until 1992 that it made an actual entry as a guest with two boats. The impact was huge with the Victory Team boats taking the first and second positions in both the races of the 1992 UIM Class 1 Championship. The following year and then went on to claim the first of its 14 Class 1 crowns in 1993 right till the last one in 2014. But, a lack of competition opportunities and minor alterations in the sport at the highest level saw Victory Team take a temporary step back and limit its participation on the international scene in the ultimate form of powerboat racing. However, this season Victory Team duo of Salem Al Adidi and Eissa Al Ali will be participating in the world’s largest marine sports championship – the Super Boat International in Key West, Florida from November 4-11. “The American frontier is nothing new for Victory Team with the Dubai team racers making an impact at various competitions way back from 1990 to 1992 in Florida and Key West. And now, as we mark the ‘Year of Zayed’, we want to leave behind an indelible mark through sports on behalf of the UAE,” explained Huraiz Al Mur Huraiz, Chairman of the Board of Directors at Victory Team. “The SBI Championship is the toughest of its kind in Class 1, and making an impact in North America will serve the cause of the UAE as we head towards hosting Expo 2020. It has been the wish of His Highness Sheikh Hamdan Bin Mohammed Bin Rashid Al Maktoum, Crown Prince of Dubai and Chairman of the Dubai Sports Council that we use sport as a facilitator for building bridges across the world. Our participation on the other side of the Atlantic will definitely help us achieve this goal,” he added. Prior to the main race in November, the Victory Team will participate in a warm-up event to be held at the same venue from September 28-30. Next on the cards for the men in blue will be the UIM F1H2O World Championship that is scheduled to get under way in Portimao, Portugal from May 18-20 followed by the second round in mid-June in London that marks its return to the F1 circuit after a gap of more than three decades. Flying the Victory Team flag will be star Ahmed Al Hameli and four-time defending world champion Alex Carella in the two blue boats. After a trial run in 2015, Victory Team’s first full season in F1 racing was in 2016 with American Shaun Torrente ending runner-up on the drivers’ standings while the team also claimed a podium with third place and 86 points. Last season, Victory Team weathered a slow start to finish in fourth with 58 points. The change this time, however, will be that the cutting-edge technology F1 boats have been entirely built by the Victory Team at its base in Dubai. The Victory Team F1 powerboat has been designed to conform to all the regulations prescribed in the F1H20 category that entails a high-strength hull constructed from carbon fibre, Kevlar, synthetic fibre, Airex and Nomex. The F1 boat is further powered by a 2.5-litre, two-stroke Mercury engine that pumps out 400hp at 9,500 rpm with the capacity to accelerate from 0-100 kph in just four seconds and the capability of reaching 220 kph flat out. “We have two world-class drivers this season and we place a lot of trust on both of them. Carella has four world titles and Ahmed has always displayed his ability to be among the top ranks. So we have our task cut out on the F1 circuit. We have been among the best teams in the past few years, and we will stop nothing short of being where we rightly belong,” Bin Huraiz promised. In the F2 class, the Victory Team will be led by the duo of Suhail Khalfan and Mansoor Al Mansoori, both with varied experiences in the world of powerboat racing. Team Abu Dhabi’s Rashid Al Qamzi is the defending champion in this category that has witnessed the dominance of Swedish drivers led by Erik Stark’s four title (2011 to 2014) and Pierre Lundin’s two crowns in 2015 and 2016. The opening round of the F2 World Championship will be held in Kaunas, Lithuania on May 26-27 followed by the second round in Aalborg, Denmark in mid-June before moving to Tonsberg, Norway (August 4-5), Ribadouro, Portugal (September 22-23) and finally to Colombo, Sri Lanka (November 10-11). “We want to see how our drivers fare in this class. We have a strategy in mind while promoting both Mansoor and Suhail to this class so that we can create a pool of drivers with the future of powerboat racing in mind,” Bin Huraiz noted. The last of the powerboat pool will be served by Ahmad Al Fahim, who officially joined Victory Team as their F4 driver for the season. The UIM F4 season will run alongside the 2018 UIM F1H2O World Championship that starts in Portugal and concludes in Sharjah. For the first time-ever, Victory Team has ventured into aquabikes while bringing in five-time world champion racer Kevin Reiterer of Austria on board for the first time this season. Reiterer, who turns 26 in August, will start off in the Ski GP1 Division in the 2018 UIM-ABP Aquabike World Championships. The opening round will be held in Gallipoli, Italy from May 25-27, followed by Round Two in Olbia, Italy (June 2-3) a couple of rounds in China with Nansha (September 14-16) and then Shanghai (September 21-23) before the racers turn to the UAE for the last two rounds – in Dubai from November 15-17 followed by the season finale in Sharjah from December 11-14. Bin Huraiz welcomed the new racers into the Victory Team. “We have been watching these talented youngsters since the past few seasons. We found that their attitude towards racing is so much in keeping with our philosophy at Victory Team. I am confident that they bring in a lot of positive attributes to the table and I wish them all the best with their first season with us,” Bin Huraiz said. “The challenges will always be there for a world-class set-up like Victory Team. We are a dedicated bunch of professionals, be it the racers or the assisting crew, who want to ensure we keep our position at the top of the standings in everything that we take part in. The past has set a standard, and I believe these racers are the best in the world in their categories,” he added.